Home / News and Events / News / Whither Fanon? Frantz Fanon may be most known for his more obviously political writings, but in the first instance, he was a clinician, a black Caribbean psychiatrist who had the improbable task of treating disturbed and traumatized North African patients during the wars of decolonization. Investigating and foregrounding the clinical system that Fanon devised in an attempt to intervene against negrophobia and anti-blackness, this book rereads his clinical and political work together, arguing that the two are mutually imbricated. For the first time, Fanon's therapeutic innovations are considered along with his more overtly political and cultural writings to ask how the crises of war affected his practice, informed his politics, and shaped his subsequent ideas. As David Marriott argues, this combination of the clinical and political involves a psychopolitics that is, by definition, complex, difficult, and perpetually challenging. He details this psychopolitics from two points of view, focusing first on Fanon's socio-therapy, its diagnostic methods and concepts, and second, on Fanon's cultural theory more generally. 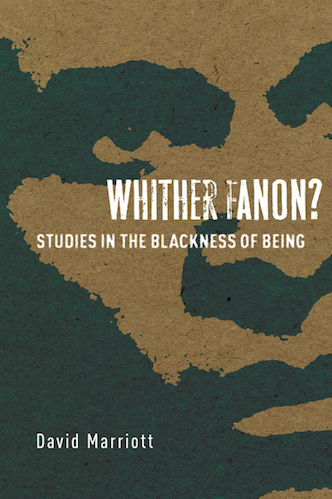 In our present climate of fear and terror over black presence and the violence to which it gives rise, Whither Fanon? reminds us of Fanon's scandalous actuality and of the continued urgency of his message.